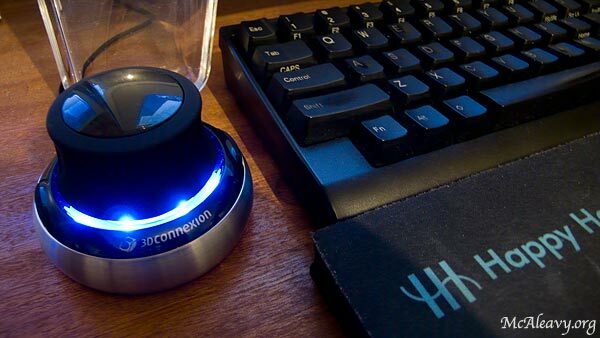 I added a new gadget to my desktop last week – a Space Navigator. For those with an interest in obscure old gaming controllers, it’s a bit like a desk-mounted SpaceOrb – a little puck that you can push and twist on its base to input movement in 3 dimensions (pan, zoom and rotate). It’s intended primarily for use in 3D applications like Maya and Blender, but the thing that sold it to me is that it can also be used in Photoshop. The idea is that you use it with your left hand (if right handed) and can then pan and zoom around an image without changing away from the tool you are using. This is particularly useful when drawing a path with the pen tool, but is also pretty handy when spotting with the healing brush. Even better, it costs slightly less than £40 and lights up blue.